I mentioned that I brought both the crab cups and cheesecake to our office holiday potluck. 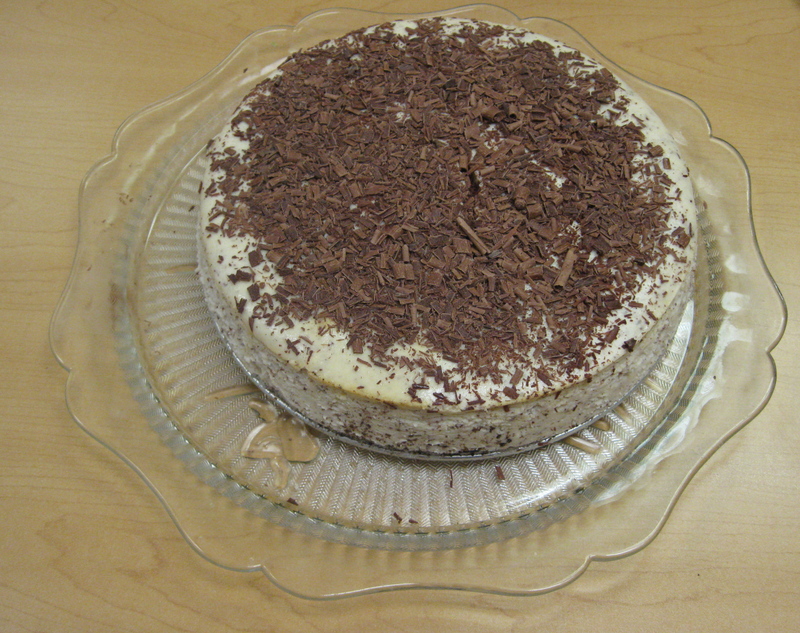 Here is the cheesecake. The original recipe was from Susan Purdy’s “Let Them Eat Cake”, which has enough wonderful dessert recipes to satisfy your sweet tooth without expanding your hips. 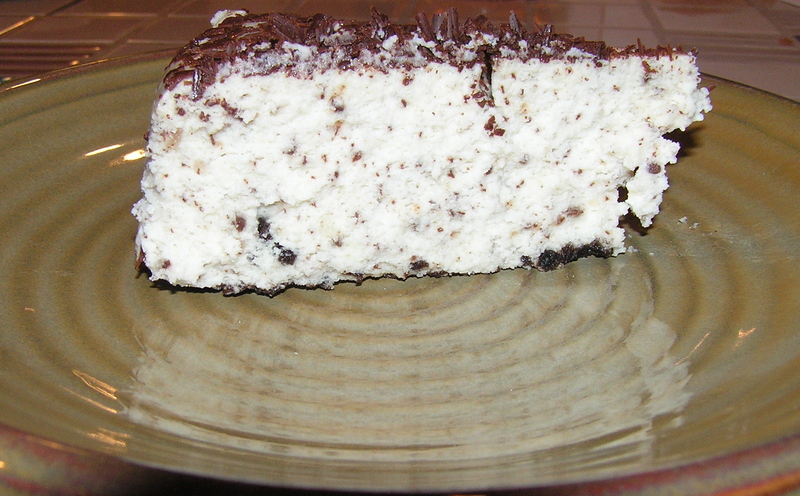 This cheesecake has lots of good things in it – rum chocolate, cream cheese – what’s not to like? It doesn’t taste like low fat. It is a little fussy because you have to put the springform pan in a water bath to bake it. But the majority of the mixing happens in the food processor. You’ll also notice that the crumb crust is barely there. It’s just enough to be able to lift a slice off the pan. I always thought that the crust detracted from the creamy cheesecake anyway. 1 large egg plus 2 large egg whites. In a small bowl, blend together the chocolate wafer crumbs and 1 tablespoon of sugar. Dust the bottom of the prepared baking pan with this mixture, making sure that excess crumbs are spread out evenly. Set the pan aside. Grate 1 ounce of the chocolate over wax paper on the medium holes of a box grater. Set aside. Place a sifter over a medium-sized bowl, and sift together the flour, cornstarch, baking soda and salt. Whisk in the grated chocolate. Place the non-fat cottage cheese in a strainer set over a bowl. Cover the cheese with a piece of plastic wrap and press on it with your hand to force out any excess liquid. Place the cottage cheese in a food processor and process for 2 to 3 full minutes until it is absolutely smooth. Scrape down the bowl and blade once or twice. Add the cream cheese (I added it in pieces) and process until smooth. Add the vanilla, rum, sugar, egg and egg whites and pulse to blend. Add the dry ingredients all at once and pulse only to combine. Do not overwork batter. Pour the batter into the prepared pan. Place the pan into the molded foil and press the foil tightly to the pan so no water can penetrate. Place the foil-wrapped pan in the roasting pan. Add hot water to reach about 1/3 of the way up the springform pan sides. Bake for one hour until the top is dry and glossy and you can touch the surface lightly without leaving a mark. Turn off the oven and leave the cake inside with the door closed for an hour. Remove the cake from its water bath, remove the foil, and cool completely on a rack. Refrigerate, covered completely in foil of plastic wrap, for at least 4 hours or overnight. Grate one ounce of semisweet chocolate and sprinkle over cake before serving (or if you are ambitious, make chocolate curls to top the cake). Makes 12 servings at 6 grams of fat/serving. In all its gooey delicious splendor! When I last visited Baltimore, my daughter and I went out for Sunday brunch at Gertrude’s. Gertrude’s is at the Baltimore Museum of Art. They have a Sunday Jazz Brunch of the sit down and be served something elegant kind. So I sat down and was served stuffed French toast with a cinnamon apple topping. It was divine. It was huge (I only ate half). It was definitely not low fat. When I got home, the memory of the brunch haunted me. How hard could stuffed French toast be to make? And lowering the fat was going to be easy – just use non-fat cream cheese and egg substitute. So I researched recipes, and found that there are two schools of thought about stuffed French toast. All of recipes called for soaking the stuffed French toasts for at least an hour; some of them called for letting it soak overnight in the refrigerator, which would be handy if you were having people over for brunch the next day. Some cooks recommended cooking the French toast on the stove top, others called for baking the whole thing in the oven – again, this would be handy for brunch for a crowd. I opted for the stove top method and set off on a stuffed French toast spree. I actually ate them for dinner most of the time, instead of breakfast, since I am not much of a big breakfast eater (except for the occasional Sunday brunch). The instructions for all the stuffed French toast variations themselves are identical, so I just listed the ingredient variations, and instructions for the different toppings. They were divine. They were huge. They were definitely low fat. Process the cream cheese and honey in a food processor until very well blended. Cut a pocket in each slice of French bread by slicing it almost all the way through. (Alternatively, you can use two slightly thinner slices of French bread – 8 slices total for the recipe – if you don’t want to mess with pockets.) Spread ¼ of the cream cheese mixture in each bread pocket (or between the slices of bread). Whisk together the egg substitute, fat-free milk, and fat free half and half. Place the stuffed French toasts in a flat glass (or non-metal) pan. Pour the egg mixture over the French Toasts, cover with plastic wrap, and place in the refrigerator for at least an hour, turning once while it is soaking. The egg mixture should be almost all absorbed. Heat a large frying pan or griddle over medium heat. Place one teaspoon of butter in pan and swirl around so the pan is coated. Place the French toasts in the pan and cook for about 5 minutes or until golden. Remove the French Toasts from the pan, add the second teaspoon of butter, swirling to coat the pan. Return the French toasts to the pan to cook the second side. Remove from pan and top with whichever topping you are making. To make the cinnamon apple topping (I usually make my topping while the French toast is soaking in the refrigerator) place all of the ingredients in a medium saucepan and cook over medium heat for about 15 minutes until apples are soft, stirring occasionally. Makes 4 servings with about 3 grams of fat/serving. The fat gram count is the same for all the variations. Make stuffed French toast as described above, adding the banana and rum when processing the cream cheese filing. Variation: You could leave the raisins out and just make rum topping. To make the ginger apricot topping, place all of the ingredients in a medium saucepan and cook over medium heat for about 15 minutes until apricots are soft, stirring occasionally. I actually wasn’t sure I would like this, because the ginger seemed a little bitter, but the ginger actually gave the French toast and the topping a subtle warmth.